Chances are high you’re aren’t actually looking for a reason to go out for Thai food — it’s really more about having an excuse to eat Thai food again! 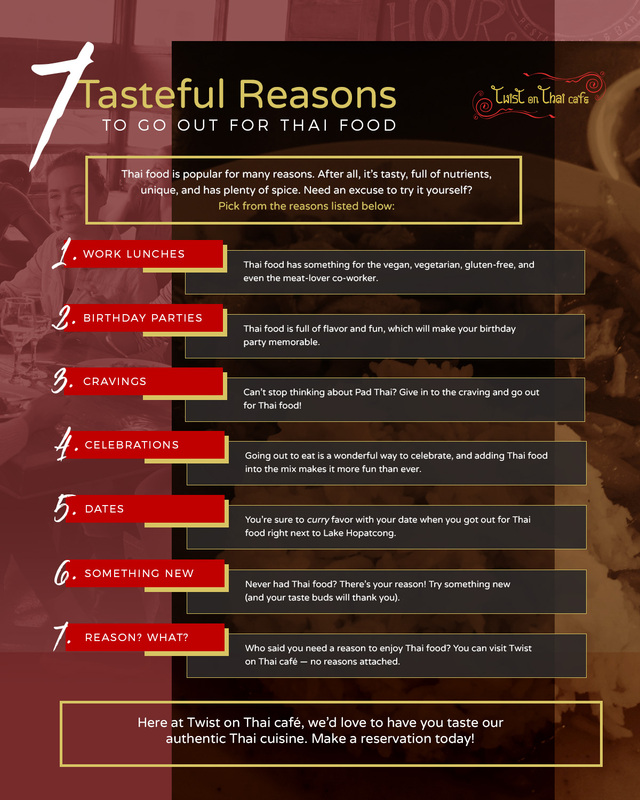 Here at Twist on Thai café, though, we’re more than willing to provide plenty of reasons you should choose Thai food when you’re looking for places to eat in Hopatcong. In today’s blog, we’ll talk all about different reasons that could justify choosing us when you’re deciding where to eat. Check out our menu today and make a reservation at Twist on Thai café, your local Thai restaurant in Hopatcong. We’ve all been there: you’re trying to satisfy the vegetarian, vegan, and gluten-free co-worker, while also trying to appease your taste buds and cravings. Thai food solves the dilemma altogether! We’re a vegan- and vegetarian-friendly restaurant, and we can make accommodations for our customers’ needs. You don’t really want to go out to lunch with your co-workers anyway, so why not choose a place to eat that you’ll truly enjoy? Looking for a good place to eat for a birthday party? 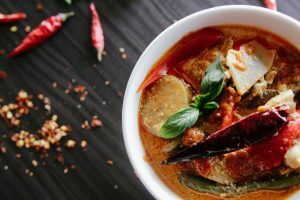 Thai cuisine is unique, flavorful, and fun, which is just what you need to create a memorable birthday celebration. Whether it’s you and your closest friends or a large party, Twist on Thai café takes reservations to make it easier than ever. Besides, why have a slice of birthday cake when you could have sweet sticky rice with mango, golden banana with ice cream, or fried ice cream instead? It’s 9:30 a.m. and you’re sitting at your desk — already dreaming about Pad Thai. You thought about it for the first time last night and you just can’t seem to get it out of your mind. There’s only one solution (and you’ll love it): give in to the craving! Cravings are often cues from our body telling us exactly what it wants, so go ahead and get that Pad Kee Maow, mussamun curry, or Por Pia Pak. Whether it’s a wedding and you want to Thai the knot, you just got a promotion, or a friend just passed a big milestone, why not celebrate with Thai food? You can be sure everyone you invite will find something they love since Thai food is so versatile, and you’ll get to order your favorite Thai cuisine — which is a cause for celebration if we’ve ever heard one! Want to curry favor with someone? Take them to a Thai restaurant in Hopatcong! Twist on Thai café is located right by Lake Hopatcong, so you could take a romantic walk down by the water and make it to the nearest Thai restaurant with no problems! By choosing a unique Asian restaurant like us, you’ll have a more memorable, positive date. Perhaps you’re new to Thai food — welcome! We love introducing more and more people to the tasty, flavorful, and unique Thai cuisine we make every day. Your waiter will be more than happy to make recommendations or explain what’s in a specific Thai dish. You can check out our customers’ favorite dishes for recommendations as well! After all is said and done, you really don’t need a reason to choose us as your place to eat in Hopatcong. Had a bad day? Thai food. Had a great day? Thai food. Simply trying to find restaurants in Hopatcong? Thai food. No matter the question or reason, Thai food can be the answer! We may be biased, but we think we have the best Thai food in Hopatcong. With unique, modern dishes and classic Thai cuisine alike, there’s always something new and exciting to try. 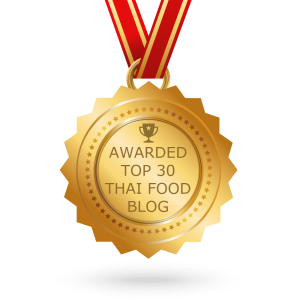 Here on our blog, we try to regularly update you so you can keep up your Thai food tastes even when you’re not with us. 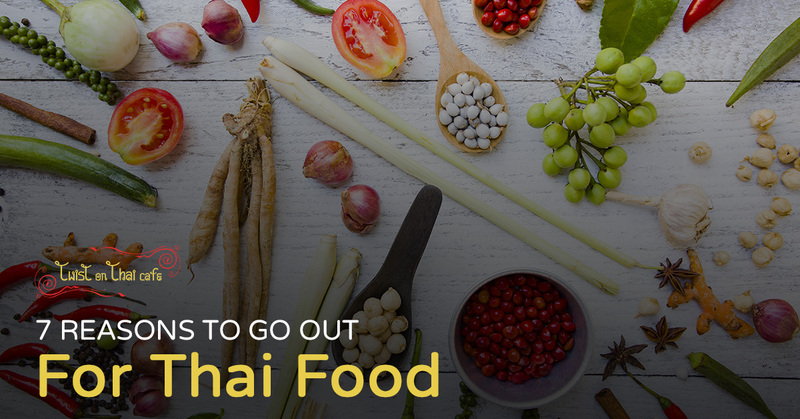 From knowing how to introduce your kids to Thai food to tools for at-home Thai food, health benefits of ginger, eating Thai food on the keto diet, and more, we’re your resource for all things Thai food. Make a reservation today — your taste buds will thank you!